Rate based on group size. Great for private parties, retreats, reunions, and celebrations. 1st 2 rooms w/1 double & 2 single beds each. 1 extra cot avl Sleep 9. 2nd 5 rooms w/1 double & 2 single beds each, 4 extra cots avl. 1 room w/1 double & 1 single bed. Sleep 27. 3rd 2 rooms w/4 single beds. 1 extra cot avl. Sleep 5. Slant-roof. Description: 28 acre estate adjoins Stowe Mountain Resort ski area property on western boarder, Green Mountain State Forest property to the southwest, and Trapp Family Lodge property on southern boarder. Pristine wilderness vistas in all directions. Quiet, romantic setting away from road. Crystal clear bubbling spring water. Winter: House adjoins ski area. Nearest ski lift 900 yards, ski-in trail. X/C ski in/out on/off, X/C base lodge 400 yards. On ski lift/village shuttle loop bus stop. Snowboard rental 200 yards. Summer & Fall: At entrance to the Ranch Valley - 3,800 acres of pristine state forest wilderness, rivers, and waterfalls. Yards & lawns for outdoor functions, campfires. 900 yards to Catamount Trail, paved recreation path & road to drive/hike to top of Mt. Mansfield. Smuggler's Notch State Park 2 miles. 4 mile hike to Long Trail which connects to Appalachian Trail. Ample parking. All smoking outdoors or in your car. No pets. Things to Do: 200 yards to dancing, live entertainment, general store, fitness center. Conference facilities nearby. Shopping, antiquing 4 miles. Winter: X/C, snowshoe and snowmobile trails out back door. Skiing, snowboarding. Sledding & ski/board jump hill. Toboggans, sleds, saucers provided. Ice skating pond (when available), sleigh rides, indoor tennis nearby. Summer & Fall: Hiking & mountain bike trails out back door (2,300 ft. vertical). 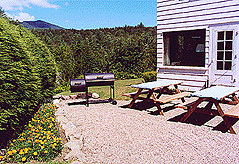 Terrace & BBQ with picnic tables for cookouts, Yamaha outdoor sound system(extra fee). Mountain brook swimming with crystal clear pool and hike nearby to (shared) waterfall and gorge. Alpine slide, tramway rides, golf, putt-putt, tennis, fishing, horseback nearby. Rock climb in state park 2 miles. Whiffleball, kickball. Badminton/ volleyball, horse shoes (request setup). Sightseeing (excellent fall foliage viewing). Amenities: TV, DVD, VCR, 750 channel satellite, Yamaha sound system, disco area(request setup), rec room with ping pong, foosball, and piano. Large fieldstone fireplace, large dining room seats up to 36, indoor/outdoor BBQ, hot tub(extra fee)(outdoor only), private massage(extra fee), brook swimming pool(summer), laundry room, telephone. Towels, linens, firewood, board games, booster seat, play pen provided. Indoor ski/board/bike stowage, ski/board/bike tuning workshop with tools. Walk-in cold storage room for food & beer kegs(winter), extra refrigerators and microwave ovens. Air conditioned naturally by elevation; window fans provided. Privacy The house is surrounded by 28 acres of private property and groups can meet without concern that noise will bother neighbors (such as can happen when renting multiple villas or hotel rooms). Space There is plenty of room for groups to meet without being overcrowded (such as happens when gathering in a single villa or hotel room) and renters have the benefit of two nearby common areas. With families, kids can play in one area while parents meet in the other. With wedding groups, singles can meet in one area while couples meet in the other. Services This house accommodates wedding parties, alumni, school, and family reunions, company and collegiate vacations or meetings, executive and graduate school retreats, club & youth group outings, and celebrations. It includes private on-site catering and housekeeping (daily in common areas, and on departure). Ski ticket discounts available. Call 800-253-4SKI and ask for group sales. Kitchen/Laundry: The kitchen and laundry have appliances for use by the caterer and housekeeping. Refrigerators and microwaves are located outside the kitchen and are convenient for baby food preparation, popcorn, beer, sandwiches, etc. Laundry service available by request. Call for written quote. Your exact daily rate depends on dates, group size, length of stay, and amenities. Above daily rates are examples that include catered breakfast and dinner and snacks. Minimum occupancy restrictions (group size, length of stay) may apply. Payment in full due 60 days in advance of arrival, or if arrival is less than 60 days, payment in full required to book. Daily rate includes in addition to above: dishwashing, snow removal, paper plates/cups/plastic cutlery, charcoal, firewood, linens, daily housekeeping (common areas only). Bring your own ski tickets, lunch food, appetizers, liquor (BYOB), ice, mixers, birthday cakes unless you make special arrangement with us in advance. 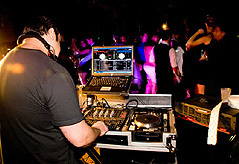 Event Policy: House parties and events serving alcohol require a social host be present. The social host must be at least 21 years of age and comply with Title 7 VSA § 501(g)(2). All events must be preauthorized by us. You agree to notify us if you are planning an event and to store and serve all alcohol at the basement bar. To prevent noise complaints, you agree to have loud music in the basement only. No open invitation. Attendee list required (attendee list verified at check-in before key(s) issued). Independent contractors (including tent erection, DJs, musicians, catering, adult entertainment) must be approved and supervised by us. $100 cleaning fee per room for unauthorized parties. You agree to pay for out-of-the-ordinary utility usage and fees incurred as a result of your event, including electrical, water and sewage. Cancellation Policy: ALL SALES FINAL For payments you have made, we refund up to what we receive to replace your reservation. If we are unable to replace your reservation amounts you pay may not be refunded. We recommend purchase of Any Reason Trip Cancellation Insurance. Acts of God: We do not offer refunds due to Acts of God and you must purchase Any Reason Trip Cancellation Insurance for protection against this risk. Acts of God include events beyond owners control which may interfere with or prevent your occupancy of the house, and include but are not limited to frozen water pipes, heating failure, septic failure, fire, earthquake, noise, strike, inclement weather, telephone failure, failure of electrical devices (including but not limited to televisions, sound systems, games, hot tubs), and acts of governmental agencies. No refund will be offered in these circumstances and your only remedy is to rebook your stay at a later date, or to purchase Any Reason Trip Cancellation Insurance. Road Conditions: Driving in Vermont can be treacherous and dangerous at times. Airports and train stations can become closed due to inclement weather. If you are unable to arrive on your scheduled arrival day, no refund is available. If you are concerned about travel delays, you are advised to leave one or two days early and stay overnight at a Hotel, and/or rent an AWD vehicle, or purchase Any Reason Trip Cancellation Insurance. While every effort will be made to keep the house plowed and accessible, we do not guarantee your vehicles ability to access the house 24 hours a day 7 days a week. Trip Cancellation Insurance: You can purchase Any Reason Trip Cancellation Insurance to cover nonrefundable trip charges, such as is offered by AAA (800-222-8252 x4 100% coverage purchase within 7 days premium ~11% of trip cost, requires AAA membership) and by general agents such as http://www.tripinsurancestore.com/cancel-for-any-reason-travel-insurance-plans/ (507-214-3854). To the extent you incur a loss for canceled plane tickets, car rental reservations, charter bus, hotel rooms, and the like, you agree to include all nonrefundable charges on your Trip Cancellation Policy and not hold us liable for these or other consequential losses. No Pets unless special permission granted. $100 cleaning fee per room for unauthorized pets.. Note some links and phone numbers below may be out of date. In that case, call 802-253-7321 for up to the minute contacts. Additional Details: Park 15-20 cars. Charter bus parking. 20 minutes from interstate highway. Floodlights on grounds for evening outdoor activities. Walk to fitness center. Winter: Heated drying and stowage room for skis, snowboards, boots & outerwear. 5 minute drive/shuttle bus ride to indoor tennis, spa, pool & fitness center, snowmobiling, sleigh rides, movies, conference center. Summer & Fall: 5 minute drive to horseback, golf, tennis, spa, pool & fitness center, movies, conference center. Phone/Internet: Telephone, High-speed FTTH cable modem service, WiFi G & N, RJ-11 jack for modem, ethernet RJ-45 jack, cell service both GSM and CDMA. Skiing / Snowboards House adjoins ski area property. 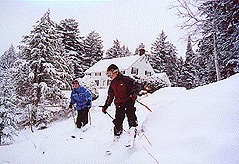 Skiers can take Stowe Derby and Ranch Camp Trail to ski home. (Ranch Camp Trail is not always rolled by snow cats and therefore may not be suitable for snowboards, small children or older skiers.) The house is below ski lift elevation and therefore a car or ski area shuttle bus must be used to get to the lift. 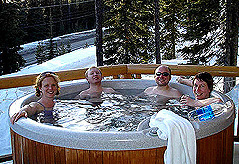 Group ski ticket discounts available. Call 800-253-4SKI and ask for group sales. Superbowl Weekend Have 8 ft. screen & 4000 lumen XGA HDTV video projector (Must request set-up). Snowmobiling The rental house is near the Ranch Camp Trail which extends into the Ranch Valley. 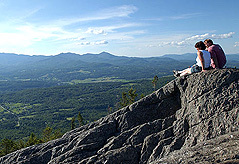 Recommended map: "Northern Vermont Hiking Trails" (available at http://www.mapadventures.com/ 207-879-4777.) This map is not specifically for snowmobiling but it shows the Ranch Camp Trail and is a relief map so that you can avoid steep inclines. 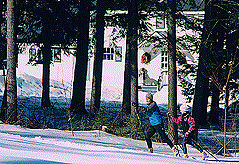 Snowshoeing Trails extend away from the house in all directions. 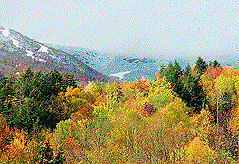 Recommended map: "Northern Vermont Hiking Trails" (available at http://www.mapadventures.com/ 207-879-4777.) This map is not specifically for snowshoeing but it shows trails and is a relief map so that you can avoid steep inclines. Skating The house has a small pond in the backyard good for kids (available for skating as snow conditions permit). The enclosed town skating rink with Zamboni machine is 5 miles away in Stowe Village. Snowmobiling / Sleigh Rides Rentals and tours available from several area businesses. Call 802-253-7321 for current information. Pool and Fitness Center Many renters take the shuttle bus or drive to http://www.theswimmingholestowe.com/ 802-253-9229. There are various nearby facilities available (for a fee); contact us for current information. Other activities: 40 minute drive to Burlington, 20 minute drive to Ben & Jerry's- Eat fresh frozen ice cream at the Ben & Jerry's factory. See how maple syrup is made at the Maple Museum. Watch apple cider being pressed at the Cold Hollow Cider Mill. 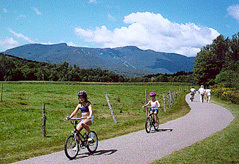 Hiking and Mountain Biking Recommended maps: "Northern Vermont Mountain Biking Map & Guide" and "Northern Vermont Hiking Trails 2ed." (available at http://www.mapadventures.com/ 207-879-4777.) Note: Hiking trails may not be suitable for mountain biking and/or may be on private property with use limited to hiking only. The Long Trail is a 4 mile hike from the house. The Catamount trail passes 900 yards behind the house. The entrance to Smuggler's Notch State Park is 1 mile north on Rt. 108. Hiking information center is 2 miles north on Rt. 108 in Smugglers Notch. Mt. Mansfield auto road 900 yards north on Rt. 108; walk or drive 4 miles to the top of Vermont's highest peak and enjoy a delightful day-long hike along the 4,000' summit ridge and a view of Montreal, Mt. Washington, and Lake Champlain. Biking and Walking Stowe paved recreational path network 900 yards south on Rt. 108. Swimming The Ranch Brook crosses the property and has a small swimming area 2-3 ft. deep for cooling off. The West Branch River also crosses the property and has a 6-8 ft. deep swimming hole in bedrock about 1/4 mile up-stream. One mile up-stream is Bingham's Falls, a huge 30 ft. waterfall and 15 ft. deep swimming hole hidden amongst ancient old-growth Hemlock trees (accessed by hiking trail). Boating, Canoeing, Fishing Waterbury Reservoir 10 miles, Lake Elmore 12 miles, Lake Champlain 45 miles. Golf, Indoor/Outdoor Tennis, Horseback, Hay Wagon Rides various nearby offerings; contact us for current information. Fishing The house is located high in the mountains near the start of streams and rivers and therefore these waters are generally to low to be fished. The nearest fishing is a 10-15 mile drive. Soaring, Glider & Airplane Rides Available at Morrisville-Stowe Airport, a 10 mile drive. Contact us for current information. Other activities: 40 minute drive to Burlington, 20 minute drive to Ben & Jerry's- Eat fresh frozen ice cream at the Ben & Jerry's factory. Stowe Mountain Resort's Gondola and Alpine Slide 2 miles. See how maple syrup is made at the Maple Museum. Watch apple cider being pressed at the Cold Hollow Cider Mill. See historic covered bridges. 1/2 hour to Vermont state house, museums and granite quarry where scenes from the movie Batman were filmed. Take a path through our woods and meet friendly turkeys, hens and sheep-great for kids!